The addition of steel reinforcement to concrete in the 19th century enabled structural concrete elements to work not only in compression but also in tension, which caused cracking in tension areas. Other common causes of concrete cracking are plastic shrinkage, settlement, drying shrinkage, thermal stresses, chemical reaction (due to alkali-reactive silica or sulfates), freezing and thawing, corrosion of reinforcing steel, overload stresses, poor construction practices, and design or detailing errors (1). ACI 224R-012 Table 4.1 provides a general guideline for reasonable crack widths. Click to enlarge. Even if concrete cracking does not affect structural performance, it can adversely affect the durability of structures by allowing chloride or carbon dioxide deep into the structural element and initiating corrosion over time. To some extent, cracking can be minimized or controlled by employing appropriate design, detailing, and construction practices and by incorporating advanced construction materials into new concrete structures (2). 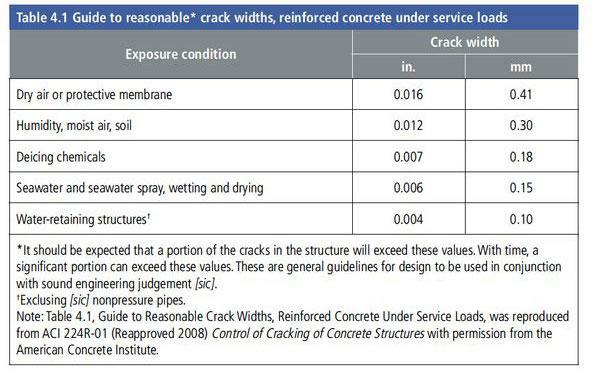 ACI 224R-012 Table 4.1 provides a general guideline for reasonable crack widths for reinforced concrete under service loads for new construction. Acceptable crack widths range from 0.004 in. (0.1 mm) to 0.016 in. (0.41 mm), with smaller widths for concrete in wet or aggressive environments and larger crack widths for drier exposures. It is up to the specifier to use sound engineering judgment along with applicable standards to determine crack widths that may lead to a loss in functionality of the concrete structure. For a concrete structure, once the allowable crack width is established and cracks are identified, their widths and depths and the cause of cracking should be determined. The width of cracks can be measured to a precision of 0.001 in. (0.025 mm) by using crack gauge cards or pocket microscopes. It is important that the actual width of the crack is measured at a clean and straight location along the crack and that the measurement does not include the width of chipped or worn edges of the crack. To determine the depth and cause of cracking, core samples can be taken and, if subjected to petrographic testing, analyzed for issues such as freeze- thaw resistance, alkali-silica reactivity, or delayed ettringite formation. The depth of cracking can also be evaluated by a nondestructive testing (NDT) method such as ultrasonic pulse velocity. Because the bond strength of epoxy to concrete is greater than the tensile strength of concrete, epoxy injection can restore the structural integrity of the concrete when applied to cracks 0.002 in. (0.05 mm) in width or greater. It is important to note that if the cause of cracking is corrosion of the reinforcing steel or if movement of the concrete is anticipated after repairs, epoxy injection may not be the best solution to the problem (3). Shallow concrete cracks on horizontal surfaces such as bridge decks or the tops of pier caps can be repaired by gravity feed using epoxies or high-molecular weight methacrylate (HMWM). Both materials have very low viscosities (less than 100 cps) and low surface tensions; therefore, they can penetrate cracks with widths as narrow as 0.002 in. (0.05 mm) without the resin being pressurized (4). Epoxy crack injection resins that are used for structural crack repairs conform to the requirements of ASTM C881,5 Type IV, and have appropriate viscosities for the crack widths and degree of confinement of the resin.6 Wider cracks that cannot be sealed on all sides require a higher viscosity (paste) injection material, whereas most cracks that can be sufficiently sealed are injected with epoxies at viscosities of 300 to 600 cps at room temperature. For applications at temperatures less than 60°F (15°C) and for fine cracks less than 0.01 in. (0.25 mm) in width, the viscosity of the epoxy needs to be lower, in the 150 to 225 cps range. 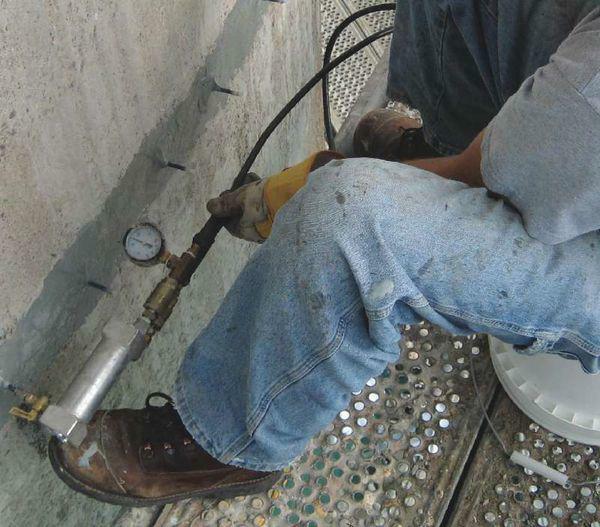 Crack injection concrete repair can be completed using air guns, hand-actuated delivery systems, spring- or balloon-actuated capsules, or single- or dual-component injection electric or air-driven pumps. For consistent performance on large or critical projects, use of a dual-component pump with positive displacement and metering capabilities is recommended. After calibration, the epoxy materials are metered by the pump and mixed to the proper ratio in a static mixer just before entering the crack. Typically, wire brushing and vacuuming the crack surface on a 2-in.-wide (50-mm-wide) strip along the crack is sufficient for surface preparation. In some cases, pressure washing, grinding, or V-grooving may be needed to access clogged cracks. Surface-mounted injection ports are adequate for injecting most cracks. Where the surface of the crack is blocked or the width of the cracks is 1/8 in. 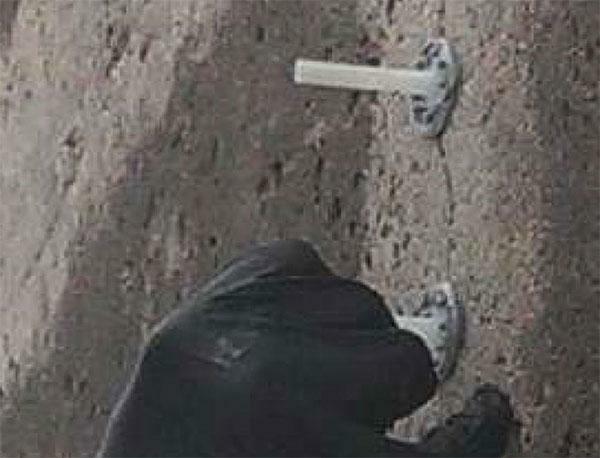 (3 mm) or larger, plastic tubing ports are directly inserted in open cracks or sealed in holes drilled to intersect the cracks. The injection ports are typically installed at a spacing that is equal to or greater than the measured depth of the crack. Once the injection ports are installed, a temporary crack-sealer epoxy paste is applied on the face of the crack between and around the ports. To contain the epoxy resin in the crack until it hardens, it is a good practice to seal cracks on all sides of the concrete element. Injection of epoxy always begins at the lowest elevation. Once the epoxy emerges at the next higher port, the current port is capped and the injection is continued from the port where the epoxy emerged. The process continues in this manner until all ports are injected. Typical injection pressures are between 50 to 100 psi (350 to 700 kPa), with very fine cracks requiring pressures of 200 psi (1.4 MPa) or higher, provided that the crack seal is not damaged by the high pressure. Raising ambient and resin temperatures can lower resin viscosity and require less pressure. Minor epoxy leaks through hairline cracks can be sealed using paraffin wax. Once the crack sealant has hardened sufficiently, the crack-sealer epoxy paste is usually removed from the surface of the concrete according to manufacturer's recommendations. Quality assurance/control measures to ensure that cracks are sufficiently repaired may include visual observation of the injection process, laboratory testing of mixed epoxy, testing the injection equipment for mix ratio under pressure, evaluation of cores sampled through the injected crack, and testing across the repaired cracks using NDT methods such as ultrasonic pulse velocity, impact echo, or spectral analysis of surface waves (7). Specialist concrete repair contractors with experience in the epoxy-injection process and manufacturers of injection resins and equipment are valuable resources for providing means, methods, and training for epoxy injection. Water is a major contributor to concrete corrosion in parking garages, bridges, industrial facilities and more. Water can leak through cracks or failed joints and often contains corrosive substances and chlorides that breakdown concrete or cause corrosion. To make matters worse, the alkali-silica reaction (ASR) in some older concrete structures can also break down the concrete, possibly requiring a repair or complete rebuild. Fortunately, it is possible to repair concrete that is showing signs of any of these problems. Depending on the severity, large portions of the structure may need to be re-built. But with the right concrete repair team, you can often avoid a complete tear down. Most importantly, the cause of the deterioration should be identified so that the concrete repairs last and the problem doesn’t reoccur. Leo Mancs is division manager, technical services and special projects, at Vector Construction in Winnipeg, Manitoba. He can be reached at leom@vector-construction.com or by phone at (204) 928-8077. ACI (American Concrete Institute). 2007. Causes, Evaluation, and Repair of Cracks in Concrete Structures (ACI 224.1R-07) . Farmington Hills, MI: ACI. ACI. 2008. Control of Cracking of Concrete Structures (ACI 224R-01). Farmington Hills, MI: ACI. ACI. 2009. Field Guide to Concrete Repair Application Procedures: Structural Crack Repair by Epoxy Injection (ACI RAP-1). Farmington Hills, MI: ACI. ACI. 2009. Field Guide to Concrete Repair Application Procedures: Crack Repair by Gravity Feed with Resin (ACI RAP-2). Farmington Hills, MI: ACI. ASTM International. 2015. Standard Specification for Epoxy- Resin-Base Bonding Systems for Concrete. ASTM C881/C881M. West Conshohocken, PA: ASTM International. ACI. 2007. Specification for Crack Repair by Epoxy Injection (ACI 503.7-07). Farmington Hills, MI: ACI. ICRI (International Concrete Repair Institute). 2016. Guide for Verifying Field Performance of Epoxy Injection of Concrete Cracks. ICRI Technical Guideline 210.1R-2016. Des Plaines, IL: ICRI. This article was originally published in Aspire: The Concrete Bridge Magazine (Winter 2018). You can read the full article and many more on the Aspire website here.